My life changed completely the day I discovered I had Thyroid Cancer. There were good changes and some not so good changes. I realize if I had known then what I know now I would have taken a different approach to some of those changes. My cancer was a gift in a lot of ways AND I have struggled with the ongoing changes to my medicine. 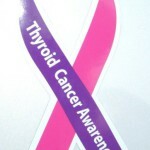 I have come to realize that although I beat cancer I will always need to manage the fact that I have no thyroid. Believe it or not, this is a very recent realization. I just never wanted to accept it before. I’ve lived in denial that my “condition” requires extra attention and some planning. I was living as though I had all my body parts and ignoring my symptoms. I never, never wanted to consider myself as having a “weakness”. The symptoms of hyperthyroidism vs. hyopothyroidism are not fun and there was no way in hell I was going to admit that I had them. Don’t get me wrong… I’m not a victim to my illness, in fact I’ve gone the opposite direction, running marathons, triathlons, living life full steam ahead. If you tell me I can’t I’ll show you how I can. I think what has been most valuable for me is allowing. I set a high bar for myself and get frustrated when I don’t reach that bar. What I’ve discovered is that the times I don’t hit that bar are usually the times when my medication is out of whack or my well being is depleted in another way as a result of my missing thyroid. Now, when I’m just not feeling at my optimum best I give myself tons of compassion, get my levels checked regularly and generally just take my overall well being more seriously. That’s a major breakthrough for me! I hope that you get value in reading this page. 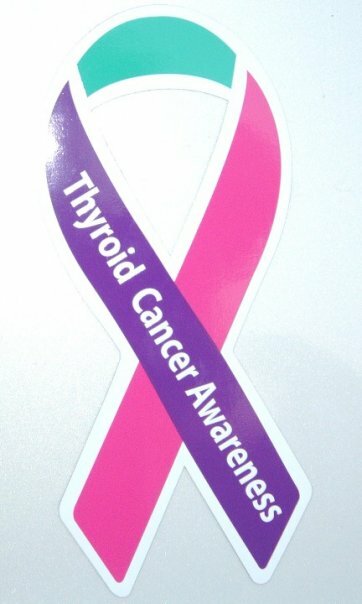 I didn’t have any support from people who had experienced Thyroid Cancer when I was first diagnosed so I made a deal with myself that I would be that for others. So here I am, happy to support you in your journey and be your encyclopedia as best I can, please contact me if you’d like to share your story or just talk to someone who “gets it”. In the meantime, here are some resources for you to visit The Thyroid Cancer Association Survivors’ Page, it has a wealth of information. Or if you are a Facebooker – THYCA.